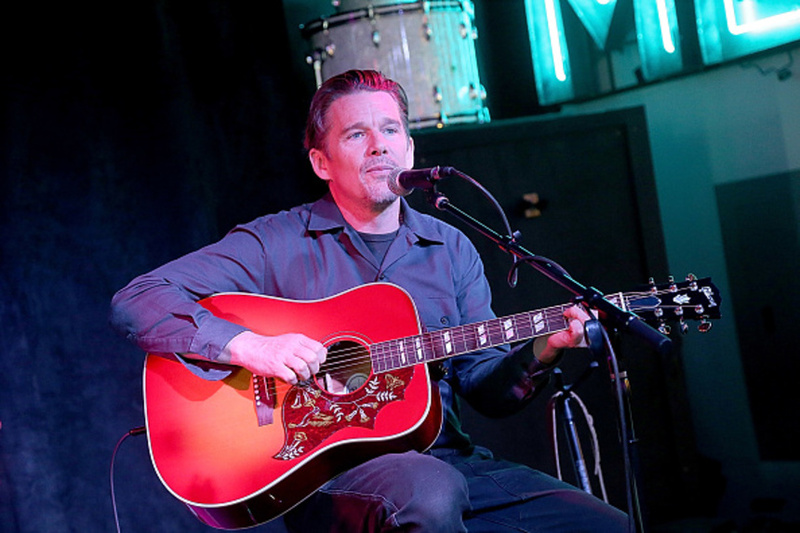 Co-writer-director-producer Ethan Hawke discussed his new biopic, ‘Blaze,’ which is about country-blues singer-songwriter Blaze Foley, at the Gibson Guitar Showroom during SXSW on March 14, 2018 in Austin, Texas. The musical drama marks the return of Oscar-nominated actor Ethan Hawke to the director’s chair, after more than a decade away from helming narrative features. He also produced the movie with his wife, Ryan Hawke, and co-wrote the script with Sybil Rosen, whose 2008 memoir, ‘Living in the Woods in a Tree: Remembering Blaze,’ served as the basis for the film’s story. Rosen penned the book after she reflected on her short-lived, but passionate, romantic relationship with Foley, which idyllically began in a tree house in the Georgia woods during the 1970s. The author’s love story with the singer-songwriter is featured in ‘Blaze,’ which played during the 24 Beats Per Second section at this month’s SXSW. ‘Blaze’ tells the story of the title singer, Blaze Foley (Ben Dickey, who won the Special Jury Award for Achievement in Acting at the 2018 Sundance Film Festival for the role), the unsung songwriting legend of the Texas outlaw music movement that spawned the likes of Merle Haggard and Willie Nelson. The narrative weaves together three different periods of time, which are re-imagined versions of Blaze’s past, present and future. The different eras explore his love affair with Sybil Rosen (Alia Shawkat); his last, dark night on earth; and the impact his songs and his death had on his fans, friends and foes. The storylines terminate in a bittersweet ending that acknowledges Blaze’s profound highs and lows, as well as the impressions he made on the people who shared his journey. Hawke and Rosen generously took the time to talk about co-writing, directing and producing ‘Blaze’ during an exclusive interview at the Gibson Guitar Showroom in Austin, Texas last Wednesday, March 14, before the biopic first screened at SXSW 2018. Among other things, the filmmakers discussed how Hawke and his wife decided to bring Foley’s life to the screen, as they felt Rosen’s chronicling of her relationship with the musician provided an emotional angle to his story. The co-scribes also praised Shawkat’s dedicated portrayal of Rosen in the film, and how the actress effortlessly showcased the author’s true connection with the title musician. When Rosen then listened to the first strumming of Foley’s guitar when she initially received his music from Triplett, “I was completely haunted. So I knew I had to retrace my steps, and revisit our time together, and our relationship. I had to understand what had happened to not only us, but also him for the rest of his life,” the scribe also shared.